They finally fixed a recent nagging access violation issue when adding more than one movie into database, with update to v18.4.7, it being the last of the 18 series. Was able to get a discounted upgrade eventually to get to that version. With version 19 they are now offering a 64bit version plus other enhancements, but for now sticking with v18, just a personal choice. Also seems like they are back to doing major upgrades with start of new version releases instead of doing in middle of a version, fixing as many bugs as possible before moving on. As for me, I see no issues with this software now, and offers loads of features, been using for many years, and have extensive collection in database, This software also creates a personal online page of your collection that you can access, which is real nice, can sync your changes automatically. I'm gonna have to knock this software down a notch. The issue I have now with it is that they insert new features late into the current version cycle, thus leaving major bugs that roll over into the next version. Because you need to buy an upgrade license, this would mean that you would practically always be having to upgrade just to get the bug fixes. This is backwards development, you introduce new features early in a new version then fix the bugs. It's as though they want you hooked on always having to upgrade. The yearly annual upgrade fee is $25 now, on top of the $50 purchase price. For now I'm waiting on a special offer price to upgrade and then I'll install the last known good version before new features were introduced that created yet more bugs, and that version was 18.0.10, which includes basically all maintenance fixes that came over from version 17.x. BTW, they used to have other upgrade options, but were removed of recent, just one option now... annual, I missed out before the change. And good luck trying to find an older known good version, because they do not offer up older versions, and VERY difficult to find elsewhere on the internet. Good movie database collector, paid for it some time back. Big drawback now is limited sources to get info/data from, but I just manually add info/data, like movie descriptions and back cover art from DVD Empire, as well as movie rating from IMDB. You also only get updates for the current base version(like if you buy version 6.0 and want the last version of the 6.x series), but you can always buy a temporary update license for a small fee later on if you so choose. I've never felt the need with the latest 5.x version. Only 4 stars for limited movie database sources. Be warned, this is a third party site and not part of the collectorz.com site. There you will see that they are essentially snuffing the users of v5. I, for one, am pissed that I wasted all of this time and now I cannot get the movies I want to add without manually doing so or relying on a subpar database. Please, join me in telling Alwin (President, Collectorz.com) how you really feel. Please note that as of today, 22MAR2009, there is a screenshot of a topic which had 6 pages of posts, which is now gone due to the team deleting it for containing negativity towards their product. Again, I recommend staying away from this product. The users clearly do not matter to this developer. Be advised, collectorz.com and the staff have deleted ALL negative posts on their forum. This was done so as to give the illusion that the product is being received with unmatched positivity. They are also trying to alienate their users that have purchased under the lifetime license program. Most of the users who complained were not only new users, but a good majority were the older users from before collectorz became big. For more information. Many users from their forums have come to post about the experience. Be warned users who submit your entries, this might eventually become a subscription service where you have to pay for DB access, thus alienating the remaining lifetime users. Do you really want them making money off the work YOU DO to enter your movies? They have remained neutral on this stance about this happening but there are signs as some posts suggesting this have also been deleted. This is completely feasible give that you can no longer download this information automatically for over 50% of movies out there since you have to use their database. You are no longer able to use IMDB, DVD Empire, Amazon, or various other sites. Previous versions worked wonderfully, but, as others have pointed out, for "commercial reasons", the latest V6 release has removed the ability for users to download movie info from various sources like IMDB and instead restricts users to using proprietary and woefully inadequate Collectorz database. To add insult to injury,the company also expects paying users to help fill the database for them after having deprived them of access to information sources that could automatically fill in the data. 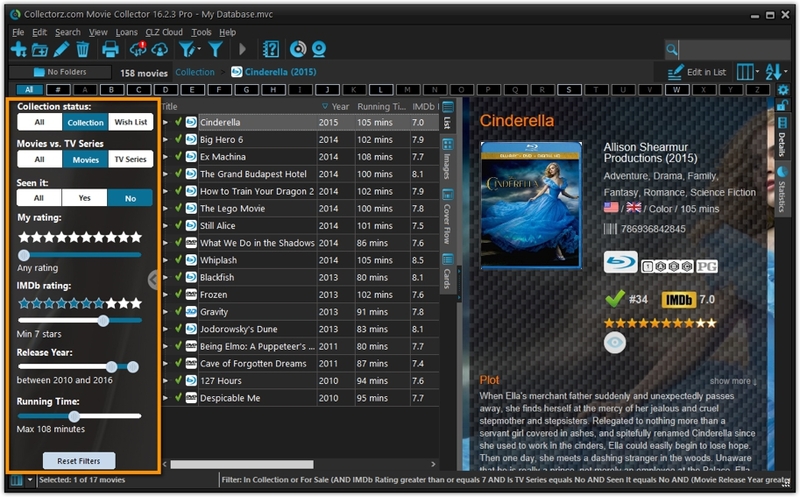 This use to be a great product to reduce the work of creating a database of your movies. Now it is just another database program with very little to lift it above freeware offerings or creating your own. I agree with the reviewer below (FixXxeR). This program has become useless since version 6 with the database change. Pros: Support IBDM is back! Bottom Line: Works for me. Bottom Line: They finally fixed a recent nagging access violation issue when adding more than one movie into database, with update to v18.4.7, it being the last of the 18 series. Was able to get a discounted upgrade eventually to get to that version. With version 19 they are now offering a 64bit version plus other enhancements, but for now sticking with v18, just a personal choice. Also seems like they are back to doing major upgrades with start of new version releases instead of doing in middle of a version, fixing as many bugs as possible before moving on. Bottom Line: I'm gonna have to knock this software down a notch. The issue I have now with it is that they insert new features late into the current version cycle, thus leaving major bugs that roll over into the next version. Because you need to buy an upgrade license, this would mean that you would practically always be having to upgrade just to get the bug fixes. This is backwards development, you introduce new features early in a new version then fix the bugs. It's as though they want you hooked on always having to upgrade. The yearly annual upgrade fee is $25 now, on top of the $50 purchase price. For now I'm waiting on a special offer price to upgrade and then I'll install the last known good version before new features were introduced that created yet more bugs, and that version was 18.0.10, which includes basically all maintenance fixes that came over from version 17.x. Version 5.6.2 is excellent! So good in fact, I bought it. Before you review this, you might want to check your facts. Users who purchased the program under the lifetime license agreement are entitled to free upgrades. You simply have to contact collectorz.com for your license. New version 5 is out, with some limited new features that apparently justifies it being a major update. (Box Set support... barely, and support for episodes of tv shows, also just barely). Unfortunately the company has also suddenly decided to make customers pay for major upgrades. That said, Movie Collector is a good application, but I'm one of several users disappointed by the lackluster latest version and their changed upgrade policy. I recommend you to use the trial and see if for instance lack of multi-disc support and box set details is of importance for you. If not, you'll be quite happy with Movie Collector! i finally gave up jumping from trial version to trial version. i love this program so much that i bought it last week.